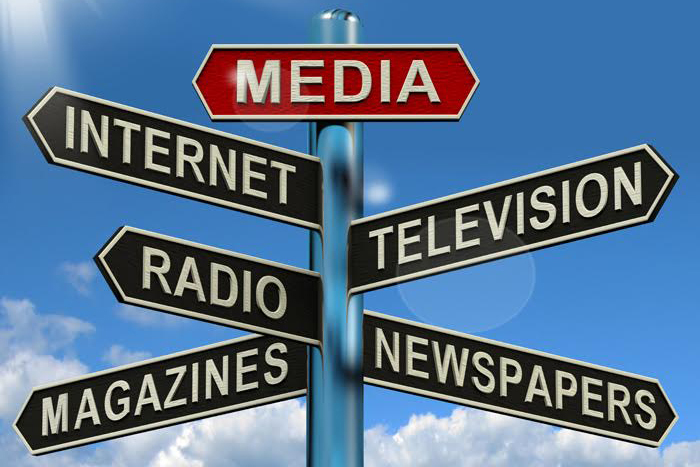 Press & Publications - Sun City, Arizona - The Original Fun City! SunViews is a free monthly publication for RCSC cardholders that provides news and information about corporate issues, Board decisions, special events, club activities and other community happenings. Delivered to each known occupied Sun City residence on the final Tuesday of each month inside a copy of the Sun City Independent newspaper, copies of SunViews are also available at all the recreation centers, golf pro shops and bowling centers. To start or stop home delivery of SunViews, please contact the Sun City Independent Circulation Department directly at 623-445-2831 or email to WVCirculation@newszap.com. Please be prepared to give your name, address and start/stop dates. Past editions of SunViews are also available in pdf format by clicking on the appropriate links below. Chartered clubs are welcome to submit news items and announcements for inclusion in SunViews. Clubs are also allowed one annual article per year. Please refer to the current submittal schedule under BP12-17(b). Items should be submitted to Joelyn Dinnella Higgins, Communication and Marketing Coordinator, in the Lakeview Clubs & Activities Office, or by email by 4pm on the 5th of the month prior to publication. For more information on SunViews, you may contact Joelyn directly via email or by phone at 623-561-4616. 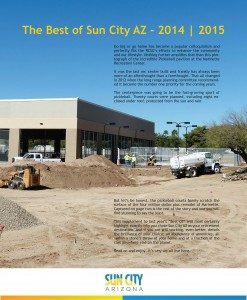 The Monthly Newsletter of the Recreation Centers of Sun City, Inc.
Sun City AZ – 1960-2016: The Best is Yet to Come! 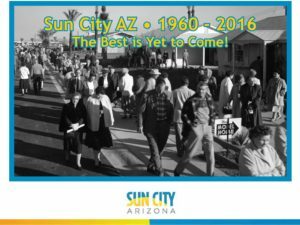 Join us as we revisit our history and look to the future in “Sun City AZ – 1960-2016: The Best is Yet to Come!” This latest annual RCSC Sun City AZ publication highlights many of the changes our community has experienced over time and includes information about the recreation centers and golf courses, area organizations, clubs and activities, and housing. Additional copies can be obtained by contacting the Sun City Visitors Center at Bell Center or the RCSC Corporate Office at Lakeview Center. We’re pleased to share with you an update on RCSC projects and events in this supplement to our inaugural yearbook. See all the latest on the Marinette renovation, the Bell Tennis complex, North and Riverview Golf Courses and more! As always, please let us know what you think and share it with others. Limited copies are available at both the Lakeview Corporate and Cardholder Services Offices. 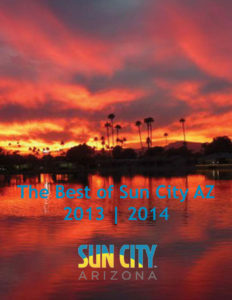 Take a look at the past, present and future of Sun City AZ in our inaugural yearbook. Share it with your friends and family! Better yet – why not hear what others are saying about Sun City AZ at www.suncityaz.org! Find out why so many believe that Sun City AZ remains the best value with the most amenities of any active adult community in the country! (Note: This publication is currently out of print and no longer available). Photographs and video may be taken at any time at the recreational and social facilities owned and operated by the Recreation Centers of Sun City, Inc. (“RCSC”). Your attendance at RCSC facilities will constitute your irrevocable consent to be photographed, videotaped and recorded, your irrevocable consent to the use of your likeness by RCSC and others acting on its behalf, for the purpose of advertising and promotion in any media, throughout the world in perpetuity, including but not limited to television and the world wide web, and your waiver of any compensation or permission for such use.